Left Wall: Ragamala (14), Udaipur (29), Udaipur (26), Eastern-Western, Ragamala (7). Center Wall: The Path to the Center Was Clearly Marked. Right Wall: Holi/Crazy Love, Sing Like the Birds Sing. Artificial flowers, plexiglass, paper, melted plastics. Bottom Left: Holi/Crazy Love. Top Right: Sing Like the Birds Sing. 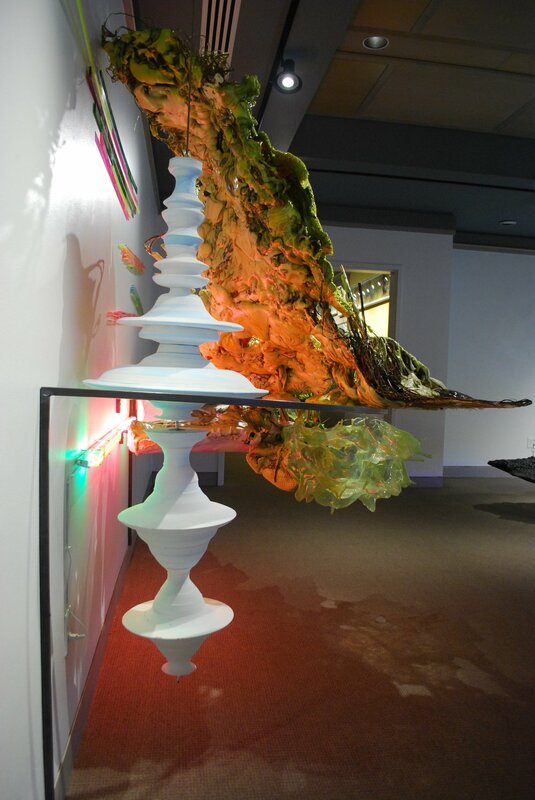 Plexiglass, expanded pigment foam, steel, cardboard, melted plastic, fluorescent lights, styrofoam, plaster, dyed plastic. Melted plastic, pigmented expanded foam, acrylic, resin, plexi glass, steel, cardboard, paper lanterns, fluorescents.